Having played a few MMO’s in the past and successfully broken my addiction to them, I was apprehensive about jumping into another. Dragon’s tale was associated with Bitcoin. Bitcoins scarcity made it a tough challenge for me to get my hands on. I was running to every faucet and giveaway site in order to collect up to my first Bitcoin. During this campaign to collect my first Bitcoin, I ran into Dragon’s Tale – Bannered as the first Bitcoin based Casino on the internet. This article will add a few links and a Q&A with the Architect who built it. I downloaded the tiny client and fired up the game for the first time. I expected slots, roulettes, card tables and bouncers. Instead, I was presented with a world of blue skies, trees, plains, water, bars, castles and a lot of avatars running around. Clicking on virtually anything in this game allows interaction and play. All the games have been mathematically calibrated and the odds are placed under the instructions of each game to enable calculated risks. There are mixes of both skill and luck based games with high payouts. What inspired me to jump in was the basic fact that I was getting Bitcoin for free. Searching the statues scattered all across the islands gives out generous amounts of Bitcoin to help avoid an empty wallet. Finding rare herbs and informing herbers about them also gets a few free Bitcoins. Depositing money through Bitcoin into the casino is easy as ever and the icing on the cake is that Dragon’s Tale gamers can also buy-in using Credit Card. Andrew Tepper, The wizard who architected this arena enabled players to cash out directly & instantly to Credit Card. Several layers of fraud detection have been built into the system. There are certain rules of buying Bitcoin with a Credit Card. Do go through these. 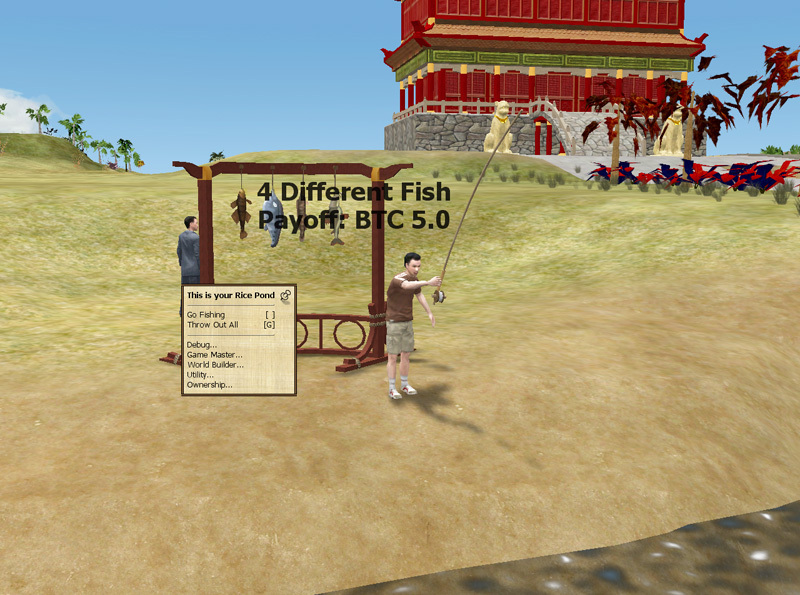 Dragon’s Tale combines the best of Gambling on the internet with a warm group of people playing on the Alpha release. With the game set to jump into beta, this has attracted several early adopters. These early adopters have moved into expertise roles within the game and are considered mentors. These mentors are extremely active and share a wealth of information with their students. I do not wish to get into details about the game play as there is a wealth of information on the Dragons Tale wiki and YouTube. Links have been posted at the end of the article. Observe who the best helper is and request him to be your mentor. Read the wiki and watch the videos, they help a lot. Don’t forget to check all the statues. There are 3 Islands and Bitcoin scattered all over. If you make a few friends they may buy you a drink. Free drinks reward Bitcoin as well. 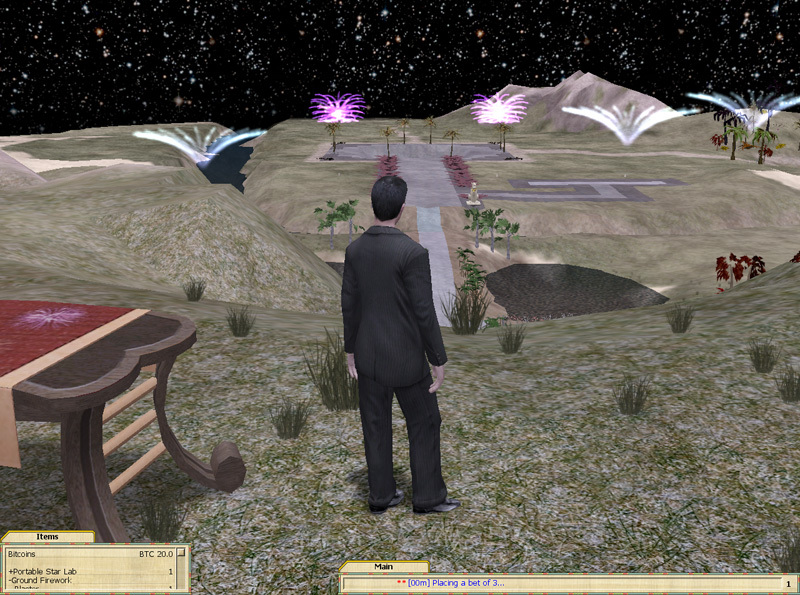 Andrew Tepper has an in game avatar named Di and his mission has created a beautiful world for people to enter for free and leave their troubles behind. He is a graduate of Carnegie-Mellon University. Before starting work at eGenesis in 1998, he ran a successful business developing software for universities. He is currently the president of the company. Ben: What drove you towards building an online Casino? Teppy: In retrospect, it seems like such an obvious thing, right? Previously I designed an MMORPG that was quite different than the standard monster-bash. A Tale in the Desert has no combat at all – you advance by solving social puzzles and crafting. So you can think of Dragon’s Tale as MMORPG that’s a radical departure in a completely different direction. Ben: How many people currently play Dragon’s Tale? Teppy: Typically we peak at about 25 concurrent users in a given day. The best-ever was 33 concurrent, but that was only a week or two ago. User counts are advancing fast. In a given week, a couple hundred log in. Ben: How long has it taken for you to build the game? Ben: What is your roadmap over the next 3 years? Teppy: The basic systems are now in place: Many different basic betting systems, mentorship, levels/quests, and tournaments. I’ve just added support for credit cards, along with the necessary safeguards. You can buy Bitcoins in-game, on a credit card, instantly. Cash outs to Visa are instant as well, and for Mastercard require a wire transfer. Of course, US players must come with Bitcoins of their own, due to our ridiculous laws. From here we’ll build on all of these basics: We’re creating new islands to explore, each with a unique look; new games, some specific to certain islands; new variants of existing games, again with some specific to one or two islands. Ben: Can people connect to Dragon’s Tale through TOR’s anonymous network? Teppy: Yes. We don’t do anything to prevent this anyway; Tor tends to be a bit laggy because your connection is routed through many computers on the way to the server and back. We don’t require any demographic information at all, unless you use a traditional credit card. Ben: Does Dragon’s Tale serve as a Bitcoin wallet? Teppy: We don’t advertise it that way, and we keep the bulk of the game’s Bitcoin balance in cold storage. So if someone tried to store a lot of Bitcoins in Dragon’s Tale, they might experience delays while I moved Bitcoins from cold->warm->hot storage when they went to withdraw. IOW, I can’t prevent people from using it as a wallet, but I’d prefer they do not. Anyway, the beauty of Bitcoin is that you are your own bank – there’s no need to trust anyone! Ben: What precautions have been taken to ensure that they are secure? Teppy: Our hot wallet contains a fairly small balance – enough to instantly pay the largest jackpots we’ve had, but not enough to instantly pay the largest theoretical jackpots. It runs on a machine with no ports open except those needed for Bitcoind. It’s in a secure data centre in Pittsburgh – biometric access, cameras, etc. The warm wallet is on a physically different machine, not directly accessibly online. The cold wallet is not online at all. The ability to obtain Bitcoin in the remotest regions has been enabled through this fantastic masterpiece of game and social design. I do hope that my passion to bring Bitcoin to India can be enabled through this channel as well. Jump in and run around a bit. It’s the Disneyland of gambling and free Bitcoin. Just wish I had more time & Bitcoins to spend on Dragon’s Tale. ← Bitcoin – In India? You can always cash out at any time, even right after buying Bitcoins. Of course doing that costs us quite a bit: We have to pay the credit card gateway their fees (about 3.5% cashing in and 3.5% cashing out), buying Bitcoins on your behalf (1%) and then selling them (1%). We also set aside 3% for credit card fraud. When you play “normally” we’ll eat all these fees with one exception, noted below. However, since you’re reading this, you probably want to know the details. When you buy Bitcoins, we secretly record an estimate of how much it would cost us if you were to immediately cash them out. Then as you bet, we estimate how much we’re making on each bet. It’s not based on whether you win or lose, it’s a statistical average, usually about 2% of bets. Games where we never make anything (Beetle Racing and PvP games, for instance) don’t count. As long as we’ve statistically covered the cash-in-cash-out costs, we don’t charge anything. Other gambling sites have a concept of “Playthrough” – if you’re used to thinking in these terms, a 6x playthrough gets you a free cash-out. If you cash-out before qualifying for a free one, we’ll just deduct our estimated cost. There’s a little meter to the right of your balance showing how close you are to a free cash-out. There’s one exception to this: If you cash-in on a non-UK Mastercard, then the only way for us to get winnings to you is by wire transfer, and that costs us 20 Euro. If you’re cashing out to a non-UK Mastercard, we ask that you cover that cost. We’ll even waive this for our best players on a case-by-case basis. Our credit card processor has promised that this wire-transfer-only restriction for non-UK Mastercard cashouts will be removed in late 2012. And finally – as Dragon’s Tale grows, some of our costs will go down. As this happens, we’ll lower the fees and/or play requirements for free cashouts. You really make it seem so easy with your presentation but I find this topic to be really something which I believe I might never understand. It seems too complicated and extremely huge for me. I am taking a look forward for your subsequent post, I¡¦ll attempt to get the dangle of it! Great reading, thanks for the share.